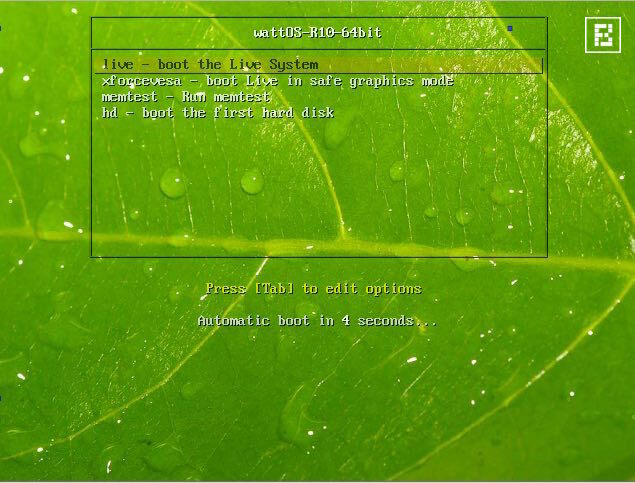 wattOS is an energy efficient Linux distribution that is known for being lightweight and fast. A few days ago, wattOS team announced the release of their latest version of wattOS R10 which is based on the latest Ubuntu 16.04.1 LTS to promote stability and long-term support. During the installation process, you’ll see a few options: to start the default live environment, boot in failsafe mode, run a memory test, or boot another existing OS. This free OS has been remastered from the Ubuntu Linux build core and it has its focus on keeping its footprint small while still delivering a clean desktop environment. You can access all the options from a single taskbar; it hosts the menu, and icons for LXTerminal, Firefox web browser, PCManFM file manager, etc by default. wattOS R10 ships with Linux kernel 4.4.0-36, Transmission 2.84, Filezilla 3.15.0.2, Evince 3.10.3, Firefox 48.0, PCManFM 1.2.4, and Gufw 16.04.1. This release replaces R9’s Audacious music player with a modern GTK+3 music player written in Python, Lollypop 0.9.112. Replacements have also been made to the graphics/picture editing department with the addition of gThumb 3.4.3. Another big change is the availability of wider support for various hardware and wireless devices which will, in turn, allow for wattOS R10 to run more easily on a variety of legacy systems. Should you give wattOS a try? If you have an old PC dying away somewhere in your house then you should install wattOS on it. You will be able to perform all the most common functions like browsing, word processing, playing music, email, etc, and it is not slow at all. However, if you are expecting to play 4K videos or carry out heavy video editing then you will not be satisfied with the experience. wattOS R10 is fast and lightweight which allows it to work perfectly fine with old computers. It requires about 192-256MB RAM for installation and just 128MB RAM to run, but it is not what you want to use for any type of heavy duty tasks. If you would like to know more about wattOS R10 you should check out the release announcement. And to take it for a spin, visit the downloads page.